Warning: spoilers for the Arrow Season 3 finale “My Name Is Oliver Queen” are ahead! After defeating Ra’s al Ghul and preventing a bioweapon from killing everyone in Starling City, Oliver Queen decided in the Arrow Season 3 finale that he was done being The Arrow. Hanging up his costume and leaving the crimefighting to the other members of Team Arrow, he departed Starling City with Felicity and left his superhero life behind him. With the show coming back next season, Oliver’s new life isn’t permanent, but if series star Stephen Amell is to be believed, the next season will see the hero being altered in a major way. E! Online caught up with Amell at the Upfronts Thursday and pointed out how Oliver had retired as a superhero, which prompted the actor to give this response. Arrow is done. No more Arrow suit. I've worn it for the last time. Seeing that Arrow is on the schedule for next season, and it hasn’t been renamed to something like The Adventures of Oliver Queen (that just doesn't have a good ring to it), Amell’s statement certainly shouldn’t be taken too literally. At first, it sounds like the actor is hinting that Oliver will be wearing a different costume when Season 4 starts. However, Oliver was seen wearing his normal Arrow suit in the Legends of Tomorrow trailer, so it can’t be as simple as him just never wearing it again. Amell did admit earlier in the interview that aside from one small thing, he doesn’t know what’s in store for Season 4, so this tidbit of information may just be referring to how the status quo was left in the Season 3 finale. Even ignoring his duds in Legends of Tomorrow, a costume upgrade would be an effective way to transition the character to what every fan wants him to become: Green Arrow. 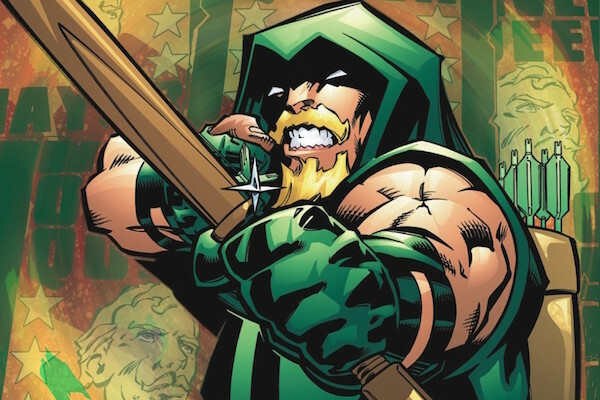 Unlike Barry Allen in The Flash, Oliver Queen hasn’t taken his superhero identity from the comics. He started out being called a vigilante/The Hood in Season 1, and in Season 2 transitioned to becoming The Arrow. Depending on what goes down in Season 4, we could see Oliver transitioning away from the Arrow and finally becoming Green Arrow, something many fans have been desperate to see. If he’s rocking a new suit next season (preferably something that's a brighter shade of green), this could be one of the final steps towards him becoming the hero he’s destined to be. So instead of the above picture, he’ll look closer to something like the image below. Fans of The Flash will remember that the future newspaper from “The Trap” mentioned Green Arrow in the lead article, so we know that Oliver will adopt the name sometime before 2024. The question now is when this identity change will occur, and if we’re interpreting Amell’s statement correctly, it may be sooner than previously expected. We’ll find out when Arrow returns with new episodes later this year.